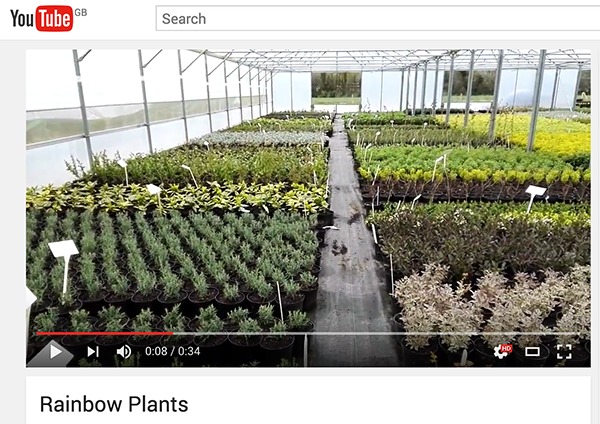 We’re launched our You Tube channel and this video link is the first in a series of views of our wholesale plant nursery available to explore, showing what we have been up to. Our first video shows the most recent potting, set out in our new triple span tunnel that is rooting slowly in this cold spring. Most will be available over the next few weeks. It is a mixture of shrubs, herbaceous and young trees that have been grown from liners sourced from specialist nurseries in the UK and Europe. Click to explore our Rainbow Plants YouTube Channel. Rainbow plants provide exceptional plants to garden centres and landscape gardeners across Devon, Cornwall, Dorset, Somerset and beyond.